So my knights now have space orangoutangs and daemonhosts accompanying them into battle! It is such a strange looking but fun force. Not bad for iPhone photos. 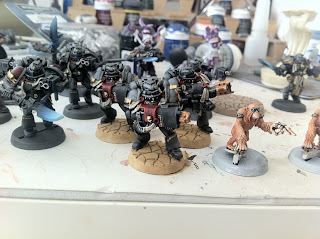 Since my Grey Knights are predominately dark cool colors, I decided to use a warm light colored base to set off the miniatures. These quick iPhone pictured don't quite do the minis justice, but they do show how contrasting temperatures can help with presentation. I need to be careful going forward to not make the reds on the GK too warm. 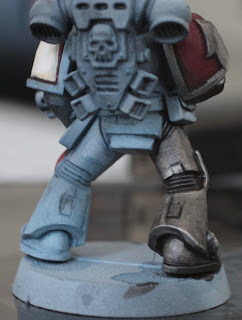 I can do this by using blue washes to shade the reds rather than red or brown washes. My bases are dirt simple. I painted them with Army painter bone, and then used the dark earth forge world weathering powder as a wash. 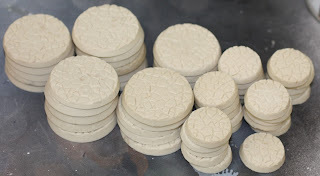 Afterwards I went back over them wiping off most of the powder from the raised surfaces. 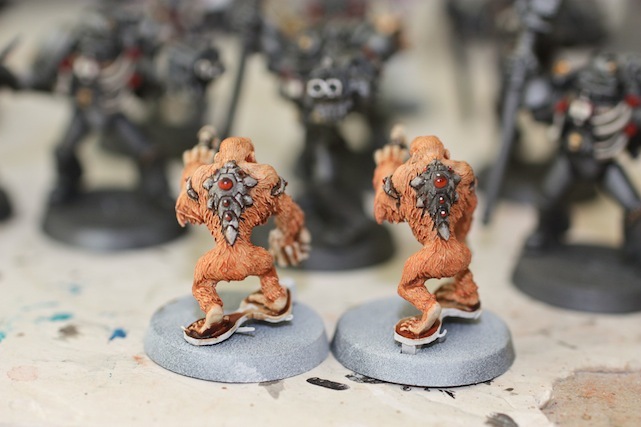 The bases are plain, but I think that helps the dark miniatures stand out. I took my light box down while cleaning my office, so these photos were done with flash. 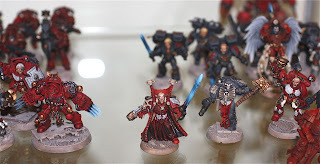 I have been paining Grey knights for a few days, which you can see in the backdrop. 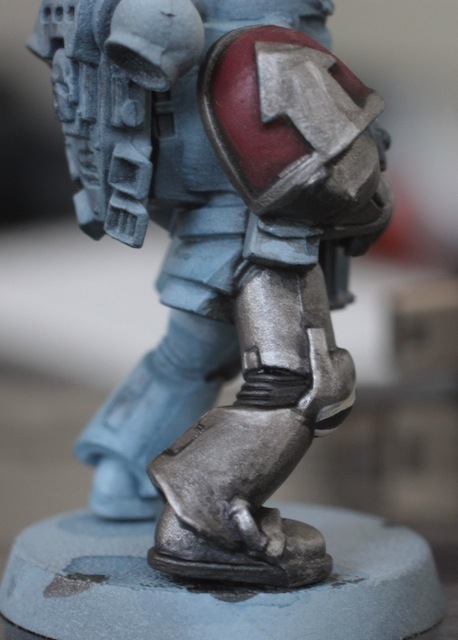 Since my knights are dark metallics, I thought the army needed some lighter colors. I added Jokero and Demon hosts in bright light colors in order to spread the color spectrum out a bit. My wife does not like the blue gem eyes. At least I did not go with my original color choice of red gems eyes! Now, on the models themselves. Jokero are small. 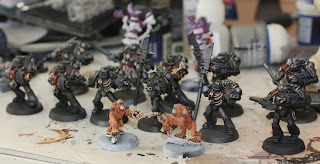 The Grey Knights in the background are the old metal Grey Knights, which are already a little smaller than the current range. 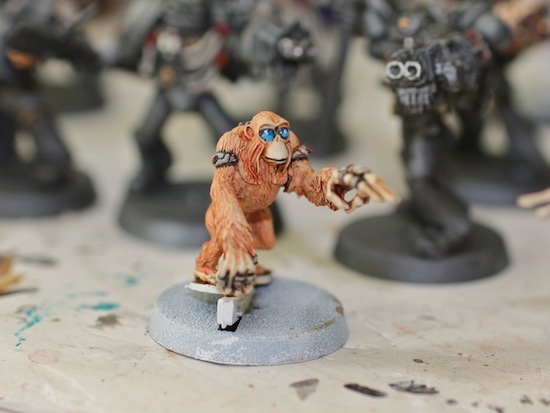 I had some trouble with the smaller scale earlier in the week while trying to paint some mordians. Despite the difficulty in painting, I really like this scale. The Jokero and Mordians look appropriate standing next to space marines. 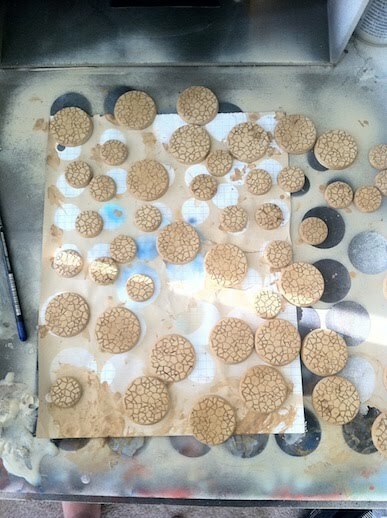 Since the grey knights army is now in full swing, I started pumping out resin bases. Since the models are dark and cool (mostly) I am going to go for a warm cracked desert theme. 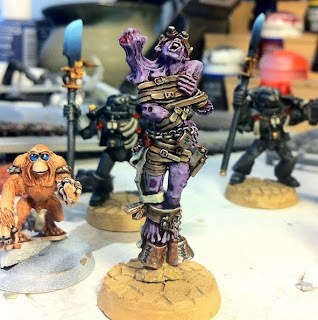 I read somewhere online that mixing color temperature could enhance a miniatures presentation. Well, here goes! I won the GW springfield 2nd founding day competition for vehicle/monster! I took my Arvus Lighter, which unfortunately I do not have pictures of finished. It is on display in the GW springfield if you are interested in seeing it. I thought I was in strong contention for best squad, but a gentleman came in with an incredibly beautiful Angels of Redemption squad that just stole the show. I wish I had photos of it. 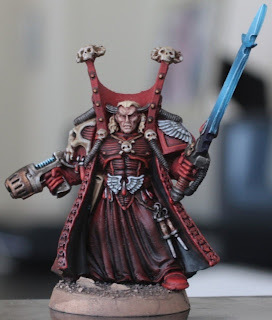 I recommend that anyone interested in painting go to the Springfield GW store and check it out. So how cool is the trophy? 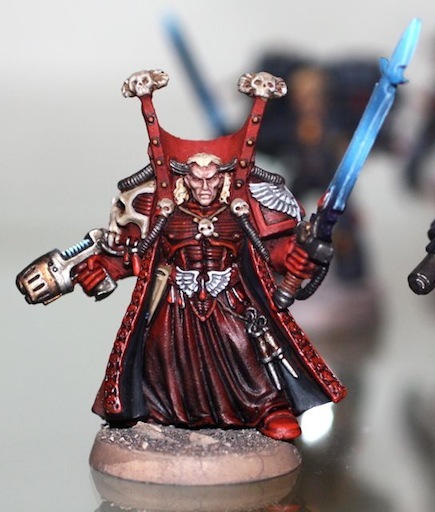 I love the brother Artemis model, and have always secretly desired one. After winning this one, and contemplating dunking it in green stuff in order to paint it up as a non-trophey, I think I will just buy one online. Bill's patina is just too cool remove with a simple green bath. The day after the painting competition I went to the Bazaar Bazaar, and traded away all of my 2nd edition Orks, Eldar, and Tyranids. 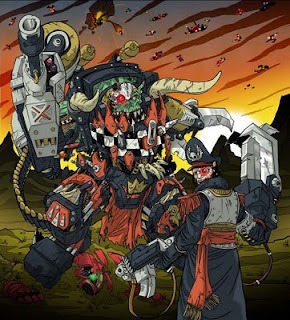 I managed to buy/trade for some weird adeptus mechanicus stuff, some cool space wolf miniatures, Mordian Iron guard, and vallhallan squads. 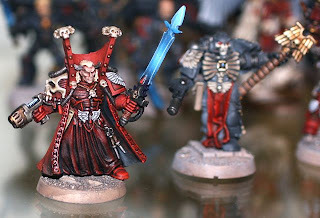 I am most excited about the Mordian miniatures. 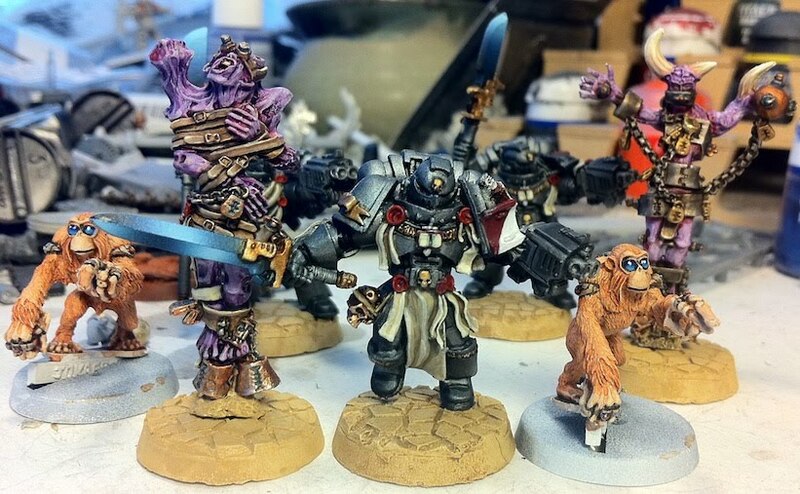 The scale is slightly different than current models, so the miniatures look better proportioned next to space marines. I kept joking to Gil, the original owner of them, that I knew they were ugly, but I really wanted them anyway. My perspective has changed. I think they look cool, and not just cool because they are goofy, but actually cool looking in person. The scale difference makes them look odd online. 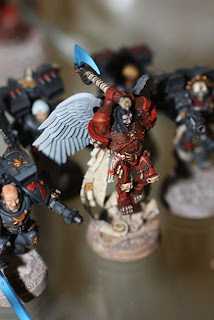 My last photos of Mephiston had a lot of glare on him, so I decided to try and take photos without the flash. These shots show mephiston more true to real life than the last ones. I am entralled by the miniature. I suppose I will have to give him a backpack and clean up the paint chips! 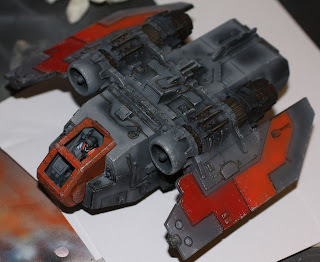 boltgun + thinner as a sort of wash to tie it all together. I am leaning towards grey Grey Knights using zenithal lighting...I mean quick and easy airbrushing from above! 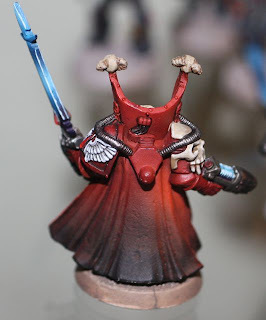 I have not applied dull coat, and I committed the terrible miniature photo taking faux pas by using a flash camera instead of my light booth, but still I could not resist putting up shots of my new Mephiston model. I am really happy with how he turned out. 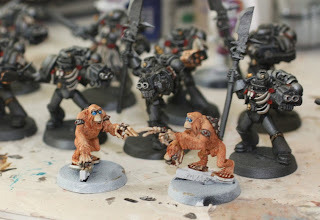 I used an air brush, followed by a lot of targeted washes and highlighting. 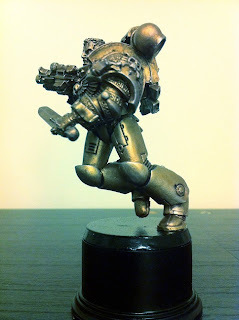 The washes left him a little shiny, but that will be dealt with in time. I am painting this army in sort of coarse brush strokes, and plan to come back for rebasing as necessary for the display board, and weathering. 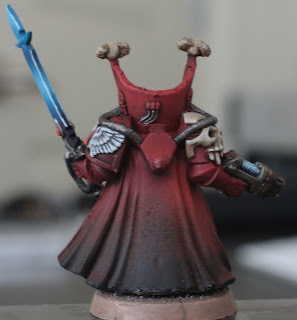 I am not sure how it is possible, but I lost mephiston's backpack, which means he will end up with a pre-heresy backpack of some type. I added a shot of asteroth because as I was painting mephiston it was fun to see how all of the details carried over. 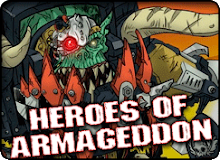 Heroes of Armageddon is coming soon. 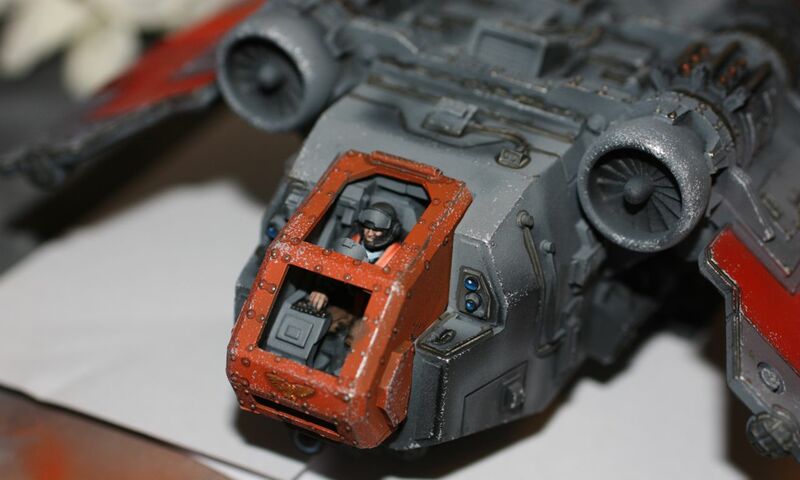 The cockpit details of my arvus lighter are nearing completion. 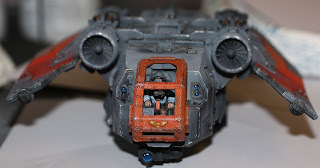 As I've noticed with older FW models, the pilot is not quite up to par with the quality of the newer sculpts. Regardless, I really love this model. It does not feel 40k at all to me though. Now that most of the paint is on, it is time for me cut out and glue on the clear plastic that will serve as the glass for the model. I have been dreading this part of the build, both for this model and for the lightening bolt. There just seems something wrong about having to makes ones own windshield! 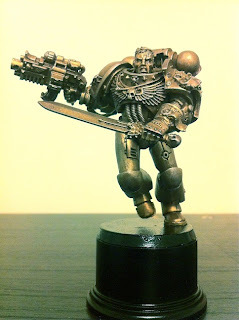 Now, how can I get my hands on the adepticon FW heresy era marine model?